The road to the pagoda is different from others with some horse gnawing grass, unlike with noisy streets below with much traffic. 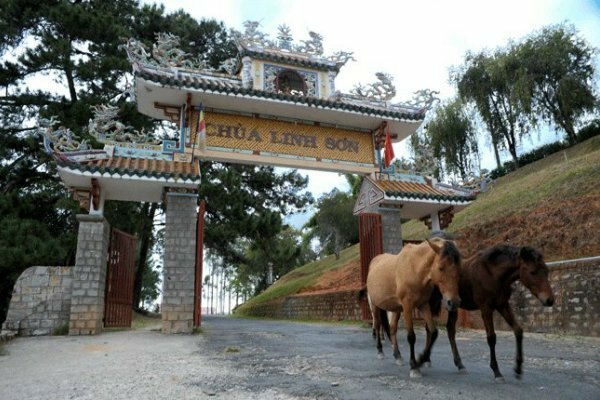 Located on a hill of 4ha on Nguyễn Văn Trổi Street, nearly 1 kilometer northwest of Da Lat city, Linh Son pagoda was built from 1936 to 1940 through donations from Buddhists everywhere, especially the efforts of Võ Đình Dung and Nguyễn Văn Tiếng. The entrance path is in the shade of pine rows and immeasurably high rubbers. Right at front yard, tourists in Vietnam tours can see the statue of Avalokitesvara standing on the lotus throne, the octagonal three-storey tower on the left, and the miniature mountains with beautiful bonsai trees on the right. There is a lake standing out in relief of green grass patch, colorful water lilies, gold fish swimming carefree, making a cheerful sight. The pagoda bears East Asian architecture, with two simple down-roofs; on the top a pair of dragons meandering in worship of the Sun. Alongside the step path to the sanctuary, there are also a pair of open-mouthed dragons engraved elaborately, a symbol of Dragon Deity preserving Dharmas. The Buddha’s altar inside is decorated solemnly. The sanctuary is used for the worship of Buddha Shakyamuni deeply meditating in ecstasy on the lotus throne. The statue was cast of brass in 1952, weighting 1250 kg. Most Venerable Thích Từ Mẫn has been the highest superior since 1964 and Buddhism’s Managing Council of Lam Dong province has its office here.